Thought Conductor was inspired by the notion: what could have occupied the mind of the musician David Tudor when he performed John Cage's silent composition 4'33"? In reality he would have been preoccupied with keeping track of time, but this led to the idea of a musical performance where musicians are responding not to an arranged score, but instead to a direct manifestation of a conductor's thought processes on stage. 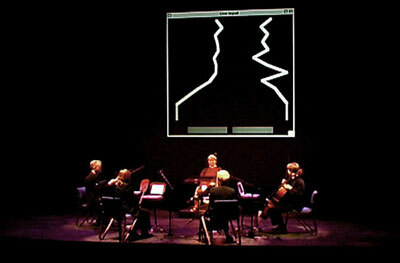 For the Thought Conductor performances, passages of musical notation remixed from the contents of a database were called up in the real time of the performance. "...score and sound aquire an immediacy which is characteristic of neuroscientific imaging in general, but which in this specific context lends new meaning to the notion of a 'live' performance. It is tempting therefore to suggest that Thought Conductor is a techno-scientific portrait that captures the inner kinetic melody of the individual who sits at its centre..."